Lovingly and sympathetically restored retaining the integrity of the period. The property is accessed via the main door in the Market Place, the large space is currently used as a studio which has cloakroom facilities and a cellar. At the rear, is a door leading to the courtyard garden from which stairs give access to the maisonette laid out over three floors, steeped with original features, exposed beams and original 9 inch floorboards. Included within, is a bespoke kitchen and a period fireplace. Next to this is an elegant drawing room with a bow fronted sash window overlooking the market place; the high ceilings make the room light and spacious. The fireplace has a Jotul cast iron wood burning stove. On the next level is the bathroom with a luxurious walk-in shower. 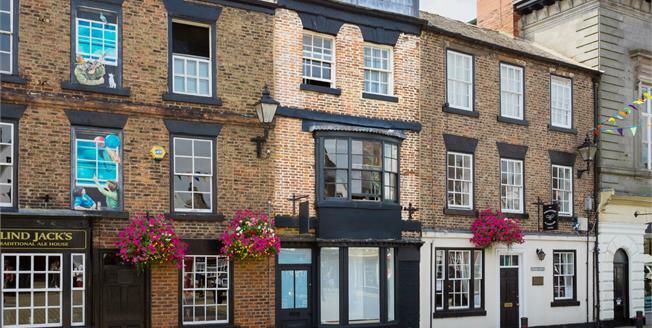 Next to this, is a large bedroom with original fireplace and two sash windows overlooking the `Market Place. On the top floor is the master bedroom bathed in natural light from the numerous Velux windows. Included in the purchase and accessed from the court yard is a self-contained dwelling, incorporating walk-in shower room, wc, fully equipped living and kitchen space, with stairs leading to first floor bedroom. It is currently rented out on Airbnb.